In 2015 Hanover College welcomed new president Lake Lambert to the historic campus located in Hanover Indiana. The beautiful campus is perched on a hill top overlooking the Ohio River valley with views fit for post cards. The president’s house, some would argue has the best view of the entire campus looking out. But looking back at the president’s house the view had seen better days. The shingle roof was old and had begun to curl at the edges and the 6 large dormers on the house, three on front and three on the back, were in desperate need of new siding. The college administration and faculty director knew it was time for an upgrade especially with the arrival of a new president so they called Exterior Pro. Over the years Exterior Pro has completed many roofing projects and repairs for Hanover College but this particular job was special. It was a way for the college to welcome their new president and show that they appreciated him accepting the position at Hanover. The job needed to be flawless, quick and clean with a lasting quality. We organized our best shingle crew and tasked them with the job. Our crew leader, Alfredo, was up for the challenge. The house is large and steep which made access difficult. The flashings are all ages copper and the gutters are all lined copper as well and needed to be protected from falling debris. It was going to be quite a job. Alfredo and his men knew the challenge and had discussed a game plan. We staged the shingle roofing material according to plan and began work. The first step was to remove the old existing shingles and get them into a dump trailer without damaging the landscaping or yard of the president’s home. The new step was to throughly clean the deck of any nails sticking up and install the new synthetic felt paper that would give the crew more traction on the step roof. Finally, it was time to begin replacing the shingles with new 50 year dimension shingles from Owens Corning. Each day a section of roof was removed and replaced so the home was never left exposed to a surprise storm or rain shower common in Indiana. Each day the yard and all the debris were collected and all the loose nails were picked up with a magnet. After 5 days of hard work up in the air using a combination of walk boards, safety harness, and ropes the shingle roof repair part of the job was complete and it was time for the hardie siding. Hardie siding looks great on historic homes and the president’s home is no exception. We tasked our two best siding installers with job. This wasn't our top foreman’s first rodeo up in the air hanging siding. He seems to have a trick and technique for everything and he put his years of experience to good work. The two man team was able to template the dormers and pre-cut each side of them thereby reducing the amount of time they spent in the air. The plan worked flawlessly and the two man team had all the new hard siding installed and trims painted in just two days. 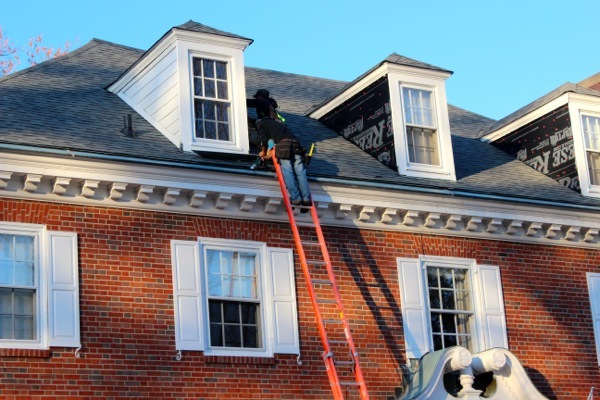 The roofing and siding repair job at the president’s home was complete. Now, the view looking at the home was as nice as the one looking out to the Ohio Valley. Both the Campus and Exterior Pro are proud of the way the job turned out.